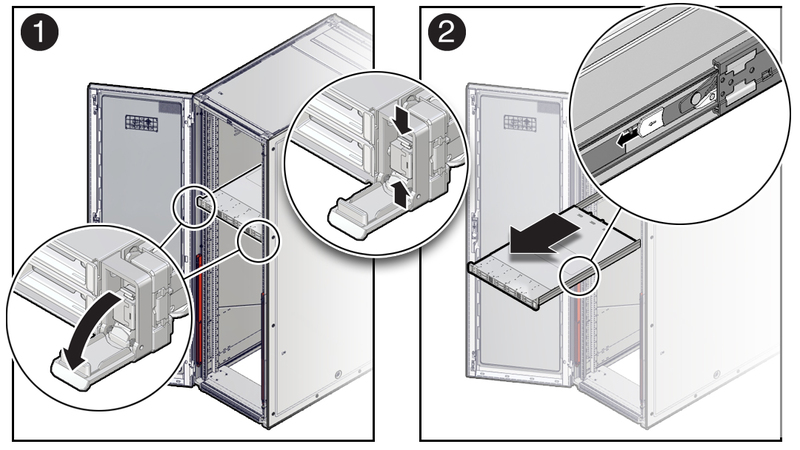 To prevent the rack from tipping forward when the server is extended, extend all rack anti-tilt mechanisms. Refer to Stabilize the Rack in Oracle Servers X7-2 and X7-2L Installation Guide. Also refer to the Oracle Rack Cabinet 1242 User's Guide at https://docs.oracle.com/cd/E85660_01/index.html. From the front of the server, open and hold the left and right release latch covers in the open position . When in an open position, the release latch covers engage the slide-rail release latches . Caution - Deploy any rack anti-tilt mechanism before releasing the slide-rail release latches.